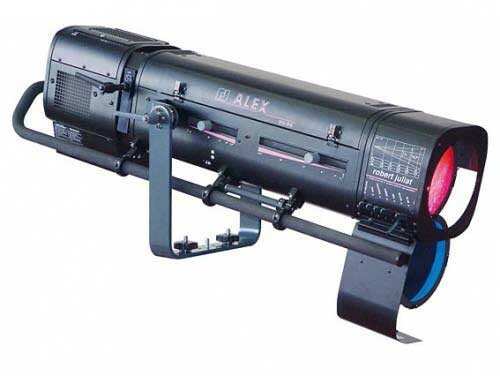 Richard Martin Lighting (RML) has announced that Robert Juliat Alex followspots have been added to their already extensive inventory and are now available available for hire. The Alex followspot is a 2500w Tungsten unit and ideal for television studios and theatre productions. It contains a mechanical dimmer, which allows a constant colour temperature during dimming while additionally maintaining the flat beam which, as we know, is important when using sensitive camera equipment. Having a tungsten lamp allows for the units to be used with conventional theatre and television lighting, making sure no hotspots are visible. With a G22 locking system exclusive to all Robert Juliat products, a localised on/off switch, and 7° to 14.5° zoom, the Alex followspot is a product designed for big impact and ease of use.